Start your day, every day, by thinking a little bit bigger. Not life-altering "shoulds" - just little chunks of information that could slowly shift your perspective away from the (as Ben Zander says) "negative spiral." I do this by watching a TED talk, most every morning. Yup, each day I intend to let some good information in. I like to see/hear what someone is doing with their energy, passion and interest. Last year at the SXSW conference (see you there next March, yes???) I took this picture after June spoke on behalf of the TED mission. Quick, after you read this, find a 3-6 minute talk at www.TED.com and watch it now! I recommend the one by Sunni Brown ... On the importance of doodling during meetings! How do you perceive how you're working? In the past 24 hours, I've presented 3 live programs - two in person, one by teleseminar. No matter how much time I have, I always set the goal: 30% prepared remarks, 70% question and answer period. The amazing thing is, however, that in the Q&A I hear the kinds of questions that I've been preparing to answer for many years! Here's something that "landed" in my journal a while ago, and I still talk about it today! 1. How do you prioritize your work? e. Then, divide those (100 or so) things in to TWO stacks... "next week" and "not next week"
Next Friday, repeat the process with the ones that are still undone. 2. How do you build a work environment that has fewer interruptions? Wow-za, this is HUGE! If you recognize that there are only 95 15-minute blocks of time in a day, you're well on your way to maximizing your focus. Right? I mean, 15 minutes is "about" 1% of your day (there are 1,440 minutes in a 24-hour cycle) and if you know that it's going to take a certain amount of time to do some of the things you need to do, well, you're on your way to minimizing or maximizing interruptions. a. MINIMIZE interruptions: As I'm writing this, from a coffee shop in Santa Barbara (Coffee Cat), my BlackBerry® is behind my laptop so I can't see the blinking red light, and I've turned off the wireless connection to my computer. Sure there's some music in the background, and a VERY interesting interview going on over to the side of where I'm sitting, but for the most part I'm away from the interruptions of my office in Ojai. I know that I can get more done, faster, at a higher level of engagement, if I have fewer distractions to pull me out of focus. b. MAXIMIZE interruptions: Ok, here's one of my FAVORITE productivity techniques... when I do call someone, or get to meet them face-to-face, I like to maximize that interaction. How do I do it? + Create a NOTEBOOK called "Agendas" or "Frequent Communication" or "My Team"
+ Voila ... maximize the interruption! 3. (And my favorite) What do you do for fun? Ok, that's a pretty personal question, don't you think?! If you navigate on over to Entrepreneur.com, and do a little searching, you'll find a bunch of articles on productivity, time-and-information management, and even email organization ideas! "How, as a team, can we get the most from email?" 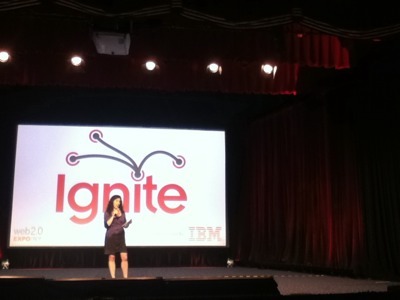 I was invited to submit a proposal to speak at #IgniteNYC (I was not selected this year). I got my ticket, called my friends and showed up at the Sheraton ready to engage. If you're not familiar with Ignite, Google it. 5 minute presentations, where people get to resent from 20 slides that auto forward every 15 seconds. I loved it. I won't go one-by-one, there were more than fifteen to listen to and watch, but suffice it to say that they were awesome! What are you doing to build your ideas? After another mentoring session (I am SO thankful for the time she gives me) with Frances Hesselbein, I took some time to think and read and write an write some more. 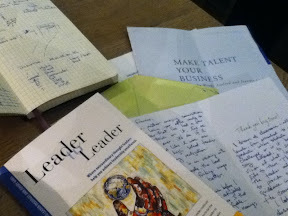 I read a couple of articles from Leader to Leader, wrote a thank you card, and drafted some more ideas in my journal. How do you find new ideas? And, are they truly "first-thought" items? This has me waking up all all hours of the day, for if we have a new idea that could change things, we could, well change things. I'm here in Zurich, on Saturday, and there was an "Occupy" event happening in a main square of town. As I walked by the people there, I asked myself, "What's the new idea they are bringing to the public domain." Over the next 96 hours, I will be re-editing (for the last time!) the book that is coming out in January. The purpose, I'm realizing, of this project is bigger than I originally thought. It's designed to help you get new ideas. I hope it works. How do you handle "different"? While in Zurich this week (and three other European countries in the past month) I got to see how people live differently. While at the bookstore one day, reading a bit of Kissenger's book, "On China" I got to see a man and his dog. My goodness is it different in California! The topic of her presentation, as I wrote my notes, was "dreaming, producing, contributing." Taking that stage one long high-heeled step at a time, she sat against (not on) the chair in the middle of the stage with an iPad2 in her hand. "I have some notes," she said, and went on to share some prepared remarks before moving over to the side of the stage for a less formal Q&A session. By telling us the story of branding efforts and product launches (and, a LOT of travel to see the world! ), she reminded us to focus on our future, to imagine it in full dimensions...all dimensions. I couldn't help but think of, while she was talking, the importance of visualization and prioritization to this process of moving from "here" to the proverbial "there." The Burberry Foundation* - as she explained it - really peaked my interest. So much so that I came back to my hotel room, and wrote her a letter to state my interest and availability, should what I do be of any help and assistance to this cause. 1) Identify disruption. See it before other people see it to think on it, model for it, and create about it. 2) Value and get the most from crossfunctional collaboration. Really let people from all perspectives see the problem. 3) Communicate...more. Do it visually. Do it often. Do it even if you think you don't need to do it so that EVERyone can see where you're going. *In 2008, with Burberry Chief Creative Officer Christopher Bailey, Angela established the Burberry Foundation, a charitable organization dedicated to helping young people realize their dreams and potential by the power of their creativity. In 2010 alone she was listed in Forbes' 100 Most Powerful Women in the World, Fortune's Businesspeople of the Year and Financial Times Top 20 Women in World Business. 3. I'm pretty sure I could get there. 4. There is no other choice. I will make this happen. Take this juvenile Bald Eagle, for example. I took these pictures from about 15 feet away, while we were living in Homer, Alaska. On the ground, a local was throwing fish this way and that, and the eagles were swooping in for some "fast food." Here's what I remember: If they caught it, they landed and ate the fish as fast as possible, only to take off again and find another one. If they missed it, their heads turned, their eyes focused, and then they went for the next one, and the next one, and the next one. Think about where you are going, and how you're gonna get there. And then, rededicate yourself to making it happen. What does Money(ball) have to do with anything? I've been in NYC now for a week - what a city. So, last Friday I reached out to a friend of mine here and said, "Let's go see Moneyball." It was very different than most of the movies I've been around lately (mostly on airplanes and in hotels). It was a "thinker" movie. Some of my takeaways. Performance means making difficult choices. Throughout the movie, the Billy Beane character demonstrates the need to make difficult choices. It's business to him. The ability to combine fact with intuition leads him to focus continually on the issue at hand. The net effect is to make a "performance-based" decision and then move on to the next thing. Agree on what the problem (really) is. My favorite scene (and surely one that I will watch again and again) happens in the office, with several people in a deep discussion around a conference table. Billy "strongly suggests" that no one but him understands the "REAL problem." My take-away, as I head in to another month of leadership discussions in three different countries (!!!) is to spend precious time and significant mindshare agreeing on what the problem is / problems are that people are facing. Surround yourself around the best. Love the scene where he hires the "economics major from Yale." This goes line-by-line with my own philosophy of asking for what you want. Just today, I wrote letters to two people here in New York City who I have followed over the years, who have influenced me greatly, inviting them to coffee later this month when I return. We'll see what happens! "If you always do what you've always done..." I know it's a popular cliche, but boy is it true. Over and over again, Billy sets the people around him to ask the question, "Is what we've done the best we could do?" Third quarter is over, 4th has just begun. As I write this, 21 hours of this 3-month cycle have already gone by. How are you doing? When you think of the next few blocks of time (and, think about how you think about time: hours, days, weeks or...), what comes to mind? 1) The world is, indeed, small. Barely 7 days ago I had just returned from Brussels, and I was getting ready for a triathlon in Carpinteria. During the two flights, with more than 13 hours in the air, I had the opportunity write about some of the things I'd seen, heard and learned while working in Europe for two weeks. One of the things that comes up again and again: Reach out, meet someone, and...stay in touch. 2) ABR: Always Be Ready. This is something I live by. Yesterday, I hiked the Grand Canyon, Rim-to-Rim, in one (long) day. At mile 22.5, at about 5:15pm, with just about 2 miles left to go, I took out my headlamp, fitted it onto my ball cap, and turned on the light. It was still sunny outside, but I figured, "If I'm gonna need this, I don't want to have to go get it then..." On the top of the mountain, later, my friends (who were waiting for me there!) said, "As soon as we saw the guy with the lamp, before he needed it, we knew it was you!" 3) I'm writing this from a hotel room in Las Vegas, overlooking the craziness of "The Strip," realizing there is a LOT more going on out in that great big world (see #1) than I can imagine. Just walking through casinos, sitting down to dinner at the restaurants, and sharing a conversation surrounded by hundreds (? thousands ?) of people is enough to get me thinking, "What's next? What's next?" Stay tuned, 'cause more is coming!